New Delhi: Telenor ASA, the world’s seventh largest phone firm by customers, has entered India by agreeing to buy up to 60% equity in local telecom aspirant Unitech Wireless Ltd for Rs6,120 crore, or $1.07 billion, in an all-cash, multiple tranche deal, extending its reach to the world’s fastest growing mobile phone services market by users. The deal, while cheaper than a recent one involving West Asia’s Emirates Telecommunications Corp. and Indian aspirant Swan Telecom Ltd, was still seen as expensive by analysts. Shares of Telenor fell 20% to 36.1 kroner each, the lowest since October 2003, triggered also by the news that the firm plans to finance the Indian acquisition through a rights issue of shares aimed at raising $1.78 billion. “Prices for assets in emerging markets have come down quite a bit, so it’s not the time to make expensive acquisitions," said Mauritz Redin, the Stockholm-based head of Swedish equities at Alfred Berg. Telenor will assume debt of $400 million in the deal. Moody’s Investors Service said on Wednesday it placed Telenor’s credit rating under review for a possible downgrade. The agency currently rates Telenor’s long-term debt A2, the sixth highest investment grade rating on a 10-step scale. Unitech Wireless is a name used to collectively refer to eight phone licensee units of Unitech Ltd, India’s second most valuable real estate firm. The Unitech units hold licences in all of India’s 22 licensed areas and have spectrum rights allocated in 13. The stake sale to Telenor will help Unitech Ltd by taking some debt off its books. “It should have an impact on the valuations of Unitech Ltd, and this will ease the liquidity crunch of Unitech, because the company can now get back the money it had lent to its telecom arm," said Unmesh Sharma, an analyst with Macquarie Research. Unitech has invested Rs2,000 crore in its telecom business, about Rs1,200 crore of which was raised from banks. Unitech has also lent Rs770 crore to Unitech Wireless. “This debt (of Rs1,200 crore) will now be on the balance sheet of the telecom company," Unitech’s Chandra said. Wednesday’s transaction, whose scope does not cover so-called third generation (3G) or data-rich phone services, will be closed in a few weeks, said Sigve Brekke, executive vice-president and head of Telenor’s Asia operations. Brekke said he hoped the Nordic company’s operations in Pakistan, where the firm is the largest player by revenues, “is not an issue" with the Indian regulatory authority. Sanjay Chandra, Unitech’s managing director, said the company will approach the Foreign Investment Promotion Board, the regulator governing investment in Indian firms by overseas firms, for the sale. Recently amended rules governing foreign investment in telecom also mandate approval from the Union home ministry. Telenor has relied on eastern Europe and Asia for growth as Nordic markets are saturated and fixed-line usage shrinks. India, which since April is ranked second behind China in number of phone customers, is also the world’s fastest growing market for phone services. In an analyst presentation, available on the Telenor website, Jon Fredrik Baksaas, the Oslo-based firm’s president and chief executive, said he expected to leverage his company’s experience in building businesses from scratch to help in India, a market he described as fragmented. India has more than 310 million mobile phone customers today, a number that research firm Gartner Inc. has predicted will rise to 737 million by 2012.
in the long term, i.e. three-four years but in the short term it is negative as the company has to build infrastructure from scratch which requires a huge amount of capital expenditure," Tore A. Tonseth, equities analyst with Oslo-based Pareto Securities, told Mint in a phone interview. He said the deal could take between four years and seven years of operations for Telenor to report an addition to its earnings per share given the competitive Indian market. Telenor’s $1.07 billion investment will be made in four tranches by September 2009. In the first tranche, Telenor will acquire 20% stake, equivalent to $250 million, in Unitech Wireless. Telenor’s investment will be made in the eight Unitech Wireless units which will then become joint ventures, said Ashok Sud, Unitech’s president for corporate affairs, Unitech Wireless. A Mumbai-based equities analyst predicted a delay in the later instalments. “...the rest of the three tranches in which will come the remaining $820 million will most probably be delayed. This is because the Telenor rights issue that has been announced to take place in the first quarter of 2009 will probably get delayed due to the current market situation," said Kevin Trindad of brokerage KR Choksey Ltd. 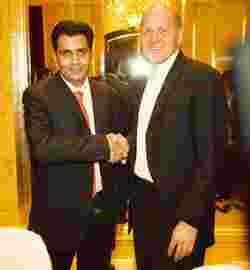 The Unitech-Telenor deal is the second among acquisitions involving a new telecom entrant and a foreign suitor. In August, Swan Telecom offloaded some 45% of its equity to Emirates Telecommunications Corp. in a deal that pegged the Mumbai-based telecom aspirant’s enterprise valuation at $2billion. In comparison, the new deal values the firm at about $1.78 billion excluding debt. After the Telenor transaction closes, Unitech Wireless will have a chairman appointed by the Indian real estate firm with Telenor appointing four directors in a seven-member board including the managing director. The chief financial officer and chief marketing officer will also be appointed by Telenor. Juho Erkheikki of Bloomberg contributed to this story.